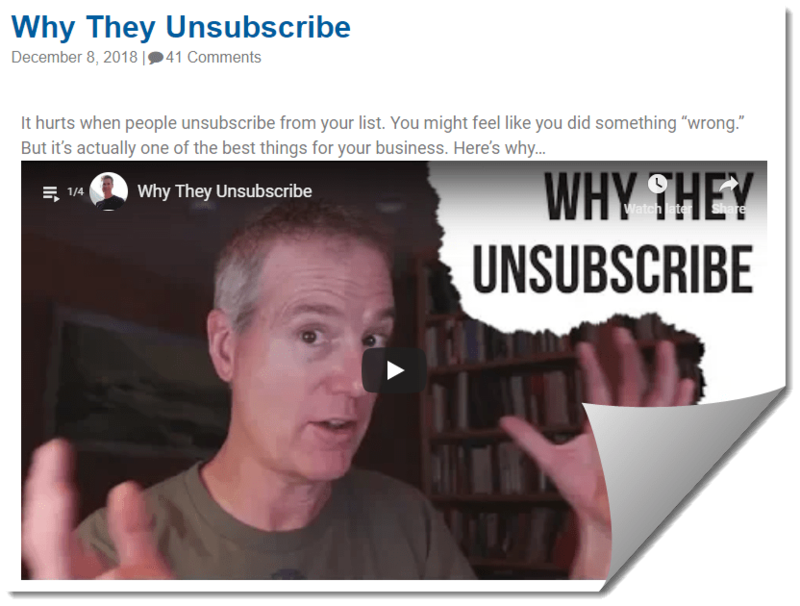 I've been list building since 2004 and one thing I know to be true – unsubscribes are part of the process. People discover me, they optin to get something that intrigues them and then they either stay with me or go away. I actually want some people to go away. We all do. Not every person out there is a great match for me or my resources. Jeff Walker shares about this in a video over here on his blog. I have a business where I'm blessed to be working with people… I have clients that have been with me 10, 12 years now, and it's amazing when you get the right clients. But to get the right clients, you have to go through a lot of the people that aren't the right clients, and they're going to unsubscribe, and they're not going to buy, and you just have to be okay with that if you want to succeed in this business. I love that he shares my perspective about being OK with unsubscribes! Go read the whole post, you'll be glad you did! I can still remember that feeling in my stomach when someone would unsubscribe. Now I understand the process and just enjoy the flow. Thank you for this post and for sharing Jeff’s words of wisdom as well.